PayrollPanda — How to integrate Xero with PayrollPanda? Help Center Home App How to integrate Xero with PayrollPanda? How to integrate Xero with PayrollPanda? PayrollPanda payroll software integrates with Xero online accounting software - all your payroll data will be auto-synced into Xero. Follow the steps below to set up the integration. Make sure you have signed up for PayrollPanda and Xero. 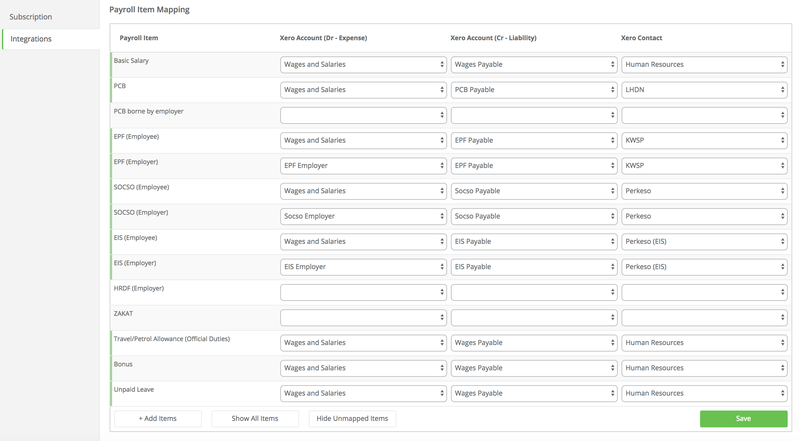 Sign in to your PayrollPanda account and go to Settings > Integrations > Connect with Xero. Login with your Xero account or register for one, and click 'Allow access'. Here you can select if you want to auto-sync the payroll data into Xero upon completing the payroll or if you want to manually do so. If you select Generate Bills Upon Payroll Submission, all bills will be automatically created in Xero. If you do this manually, you can sync it yourself by clicking Sync with Xero under Payroll History each time you complete the payroll. Net Salary: Map total net salary and each of the statutory payments. Gross Salary: Map gross salary and employer statutory contributions. Basic Salary: Map basic salary, employer statutory contributions and any additions/deductions (E.g. Travel allowance etc.). A detailed sample for each mapping type is provided below under Sample Mapping. Based on the type of mapping selected, you need to map the PayrollPanda items to Xero Accounts. There are two Xero Account types we need to map to, Xero Expense Accounts (Debit) and Xero Liability Accounts (Credit). One Contact (Single bill): After which one bill is created per payroll run, e.g. Human Resources Bill with a breakdown of all salary and statutory payments for that month. Multiple Contacts (Multiple bills): After which a bill is created for specific payroll expenses, e.g. Human Resources Bill, LHDN Bill, KWSP Bill and Perkeso Bill. To add a contact in Xero go to Contacts > Add Contact. Note: If you create multiple bills, on the balance sheet it will appear in Accounts Payable under Current Liabilities. If you use a single bill separate items will appear, e.g. Accounts Payable, PCB Payable, EPF Payable etc. Upon completing the mapping click 'Save' at the bottom and you are set to run payroll. Below you find a sample mapping based on each of the different Xero mapping options as described under 2. Set up sync settings. Here you have to map the Net Salary and each of the Employee and Employer Statutory Contributions. 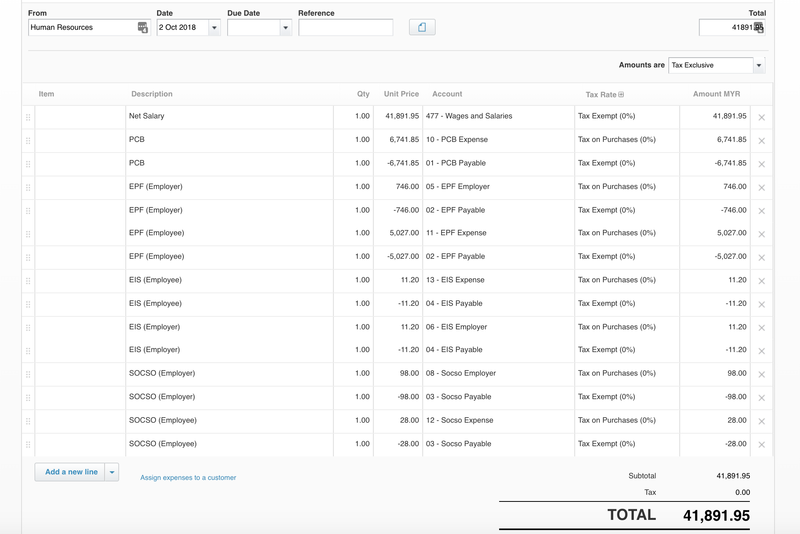 Each of the payroll items is mapped to an Expense Account and a Liability Account, e.g. PCB Expense and PCB Payable Account. 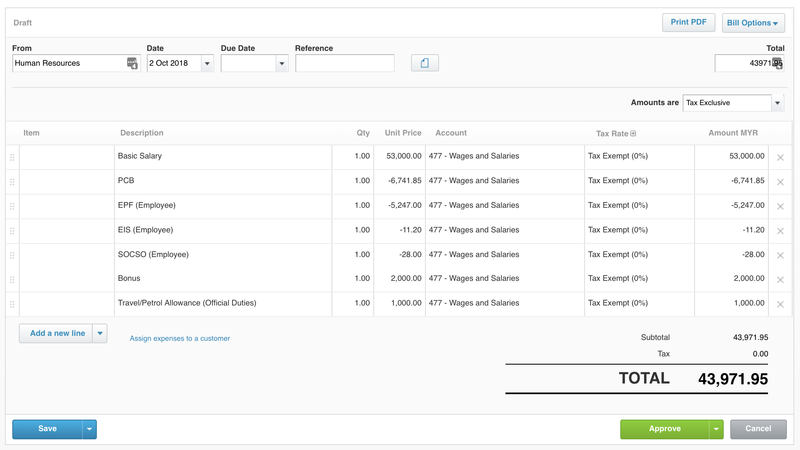 In this sample we map it all to one Xero Contact so one bill is created in Xero, the Human Resource bill. In case you want to map it to multiple bills you can refer to Gross Salary Mapping Example. Once the bill is accepted the payroll data is reflected accordingly in your P&L and Balance Sheet. For Gross Salary, instead of the Net Salary the Gross Salary and each of the Employee and Employer Statutory Contributions will be mapped. Important: Note that Gross Salary and Employee Contributions need to be mapped to reflect in Xero accordingly. Employee Contributions will be deducted twice to ensure it's reflected correctly in the P&L and Balance Sheet. In this sample we map to multiple Xero Contacts so multiple bills are created in Xero. The Human Resource, LHDN, KWSP, Perkeso and Perkeso EIS bills accordingly. Once the bills are accepted the payroll data will reflect in your P&L and Balance Sheet. 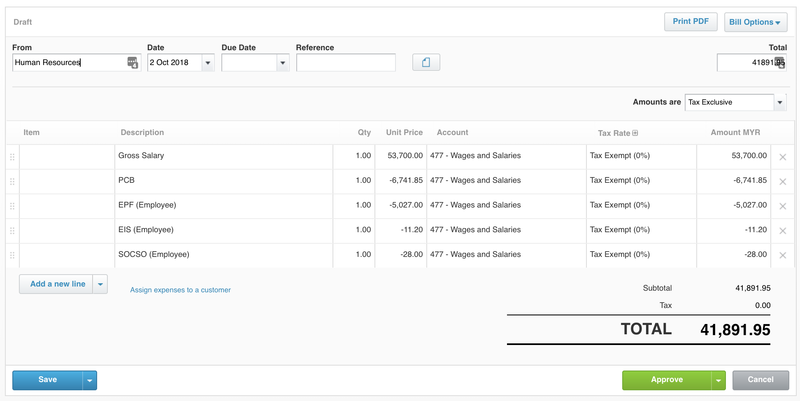 Basic Salary allows you to map each of the payroll items, i.e. Additions and Deductions. It's important you map each of the payroll items you use in your monthly payroll run, such as Overtime, Bonus and Unpaid Leave. Tax allowable deductions (E.g. Lifestyle Relief, Higher Education Fees etc.) and BIKs can be excluded as they won't appear in your accounting software. Important: Note that Basic Salary and Employee Contributions need to be mapped to reflect accordingly in Xero. Employee Contributions will be deducted twice to ensure it's reflected correctly in the P&L and Balance Sheet. If you need further assistance with the set-up, you may reach out to us via the in-app chat. How to increase EPF Contributions for an Employee and Employer? How to add companies to a managed payroll account? How do I add the salary of employees who are paid hourly or daily?